including two shades of pigments from NYX, Oro Pearl and Rust Pearl. Oro Pearl is a bronzy-gold shade and Rust Pearl is a Red Fuchsia shade. definitely comparable to high-end make-up lip pencil products. The downfall of soft and hydrating lip pencil/liner is always its lack in constancy. Yet, I still loved the wide range of choice in shades and the product itself. NYC Blushable Creme Stick in #649U Berry New Yorker. This one is also very hydrating and creates a naturally dewy finish. I wasn't going to make this purchase but I tested it out and it felt something like foamy mousse. It literally "melted" on my skin. I'll have to use it more in order to deliver an appropriate experience with it but I seem to be in huge favour of it already. 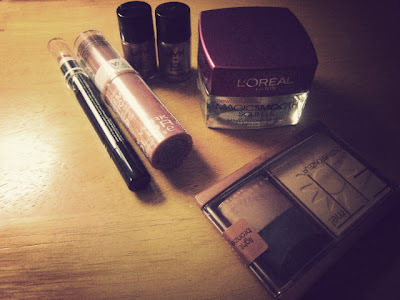 Maybelline New York Fit Me! Bronzer in Light Bronze. I recently purchased MAC pigments from thebodyneeds2.com. They arrived in a yellow envelope just as pinkyparadise.com did but without bubble wraps in side. Instead, the containers were safely wrapped in thin white styrofoam. Here are the nine pigments I purchased. They were all nicely labelled at the back. And I guess I'm missing chocolate brown. I'll upload the picture soon! These were more thickly wrapped with Styrofoam. that would help to mix up the mixing medium. I am a huge fan of Starbucks tumblers. I did my review on Starbucks Tumbler that I purchased in Korea but I couldn't pass on this one. It was a real eye-catcher. (and it only costed $14.95+tax). And you have to buy the ones on display, not a new tumbler. Also, the inside was plastic so I could not carry hot beverages around. I'm trying to show you how tall this tumbler was. Can you tell? I'm satisfied with this tumbler because now I can carry larger amount of beverages. Anyways, that's end of my haul. I still have lots of pigments to come (I ordered more a week after purchasing those) so please check out www.thebodyneeds2.com or follow me for more pictures and make-up tutorials with these pigments!